Dave Navarro, me, Perry Farrell, Steve Perkins, & Chris Chaney. I’ve seen other friends do it — they post pictures on Facebook of celebrities they’ve seen at airports, or on their flights, or at a store. The pictures are taken from afar, zoomed in, etc. I have a couple of Michael Franti from this past summer. Eventually they came in as a group into the gate waiting area, and I guess they looked incognito enough that only one other person walked up to them for pictures. None of them were in makeup, which makes a BIG difference. After that individual finished, I walked right up to them to say “Hello” and eventually ask for a picture. I was in uniform, and wondered if they were going to treat me funny because of it. I said “Hello” and Dave Navarro immediately picked on my camouflage uniform, claiming for about a minute that he heard a voice, but couldn’t see anything. After a few minutes of dialogue about the De Luna Fest concert they played last night, and some inquiries about what I did for the Air Force, we posed for this picture. The band members (and their managers) were all VERY VERY nice and it was a pleasure talking to them. They all thanked me for my service (which I always feel funny about hearing from folks). Well, that was fun, and I’m now back in reality, sitting in the USO in Atlanta Airport among dozens of tired soldiers and Marines getting ready to head back to Afghanistan. I also have to admit that I really enjoy traveling and I like to think that I travel pretty well. But probably not as well as I used to travel, when I’d work a full Air Force day and then hop in the car and drive from Fort Polk, LA to Keesler AFB, MS to spend the weekend with Dave while he was TDY. Right after Christmas 2006, I took the boys on a 2-week trip to New York and New Hampshire to give Dave some time to prepare for his comprehensive exams while he was at NC State. People thought I was CRAZY, but it turned out to be a really great trip. January 2006. Jacob has always been such an angel in the car! Last month Dave and I parted ways about halfway through our vacation. I continued northward to Vermont, while Dave caught a flight out of Harrisburg back home since he had to return to work. Again, folks commented about how brave I am…or how crazy I am to make such trips on my own. I love driving. I guess I get it from my Dad. My sister is the same way — after all, she and her husband drove with their THREE sons from North Carolina to Nevada, taking a “southern route” westbound and a “northern route” (including our house in Nebraska) when they returned eastbound. In every other way, traveling solo with my sons was great. I only had one issue: rest stop restrooms. I’ve put up a blog poll about this before: At what age is your child old enough to go into a public restroom on his/her own? I believe most of my responses were in the 7- to 8-year-old range. So here I am, stopping on I-81, the New York State Thruway and I-65 rest areas and was just sending my sons into the restrooms. But I was GLUED to the exit door waiting for them…my ears were really close to that doorway listening for them making sure they weren’t abducted. Since I made it back to Florida with both boys in tow, it’s safe to assume that my sons survived the rest area restrooms. But this leg of the trip certainly got me thinking about how single parents do it — traveling and trusting their babies in roadside restrooms. I will admit, we have the built-in DVD player. But we put some planning into how much the kids use it. For starters, we have a “30-minute rule” in our SUV: no movies unless we’re traveling more than 30 minutes. But on longer road trips, I insist that the boys put some space between their movies, especially of there are particularly scenic parts to the trip (such as driving through downtown Atlanta or crossing the Hudson River on this last trip). Don’t rule out good-old fashioned road trip games: The License Plate Game, Auto Bingo, and I Spy are all family favorites! I’ve heard of other families doing this with success, you could try using the rest area or fuel stops as break points between media: perhaps 2 hours for a DVD, then 2 hours of Nintendo, then 2 hours of “looking out the window”. With young kids, don’t forget to try to work in some activity time to make the hours of sitting less terrible. Stop for lunch at a Chick-Fil-A with a kids’ play area, or find a rest stop on your route with a playground and pack a picnic lunch. Dave and I used to frequent the Amtrak Auto Train station in Lorton, VA as a rest area when we’d make our drives from North Carolina to Pennsylvania or New York: there’s a nice playground, and at lunchtime the kids would enjoy seeing the vehicles getting loaded onto the train cars. 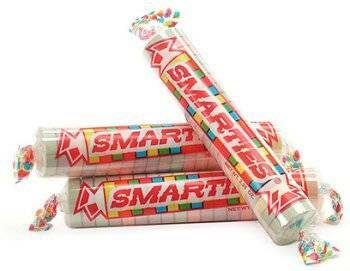 A Blast from the Past: Smarties! A small British grocery store opened up right up the street, called The British Pedlar. The ladies who are running the store are very kind and they have just about everything that I remember from my childhood, when my mom would frequent the British grocery store in Virginia Beach OR she’d bring things back from our trips to Hong Kong when I was a kid. The store has everything I remember except one thing: Bovril! Click that link to read more about Bovil not being available in the U.S. The ladies said it’s just too complicated and the FDA is really slow-rolling the customs approval process even for the non-beef version. 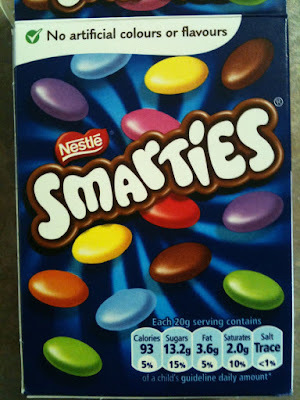 For the unfamiliar, Nestle’s Smarties are very similar to American M&Ms. Chocolate drops covered in a hard candy shell. But there’s a…well…fruitiness to the Nestle Smarties that I’ve always enjoyed. Anyway, on my most recent visit this week, the store was out of the smaller packages of Smarties, so I picked up a bigger box. I’d never seen the bigger box in detail, so I was intrigued by the picture on the back. I knew there was a fruity flavor (flavour?) 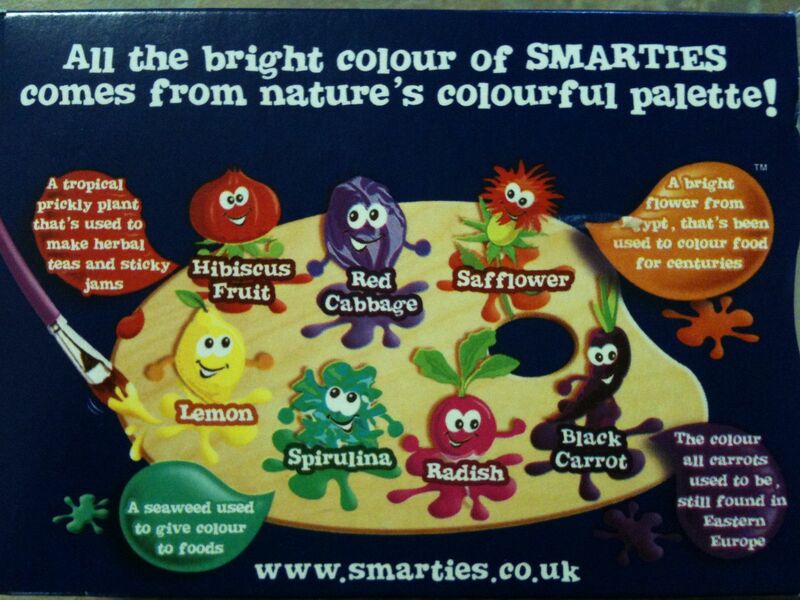 to the Smarties but I never realized I was tasting the all-natural coloring to the candy shells! The kids got a kick out of the picture and the information, then got a bit squirmy about eating any more of the green ones, ha ha! Eating Nestle’s Smarties brings back so many memories, and I enjoy sharing these things with the boys. I might have mentioned it, I might not have, but I kept my Reserve position at Offutt AFB, Nebraska even though I now live in Florida. I’ve received dozens (yes, dozens) of inquiries about why I would want to do that. 2.) This position has a lot of flexibility. I am known as an “Individual Mobilization Augmentee” type of Reservist (or “IMA” for short). In other words, I’m like an understudy-type capability to an active duty staff element. If something were to happen that the active duty element needed more people, I could get called up to help out. In my previous position in South Carolina, I was a member of a Reserve unit, and I was expected to be present one weekend per month. As an IMA, I’m presented with times on the schedule that my help would be appreciated, and I balance their schedule with my own…and I’m allowed to stitch together several “one weekend per month” equivalents and not have to travel monthly. 3.) I’d only been in the Nebraska position for about 1 1/2 years. It took nearly a year to receive all my training for this position, so I was trusted “unsupervised” only since last summer, and I feel that I owe more fruitful time to this position and the team I work with. Therefore, around Christmastime I worked out with my active duty boss that I could give 4 work days to my shop in late Februrary, and I bought a plane ticket. For these “one weekend per month” type work periods, I’m expected to supply my own transportation, so YES, I’m eating the transportation costs in this case. Thank heavens for credit card reward points! Right after the President’s Day long weekend, I kissed my boys goodbye, put them on the school bus and set off for the airport. Fortunately, there was nothing hindering my trip TO Nebraska, a small snow event was putting itself together for a couple days later. I picked up my rental car…as usual they were “out” of the super-ultra-mini-sub-compact cars I usually reserve, so I was offered this Ford Mustang. I’ve always wanted a Ford Mustang, and this one was a lot of fun to drive…at first. After I got my rental car arranged, I then went to collect my suitcase. Yes, I checked a suitcase on Delta airlines. But I traveled in uniform, in part so I didn’t have to pay to check the bag, no questions asked! It was a good thing I was in my uniform…my suitcase never showed up. Even though I flew from Fort Walton Beach to Omaha via Memphis, my suitcase flew via Atlanta and hadn’t arrived. I filled out the appropriate paperwork, and the luggage office clerk assured me that the suitcase would be delivered that night. So I stayed up till about 12:30am waiting for it, but then it didn’t arrive. Boo! So with my gracious hosts providing me some sleeping clothes, toothpaste and soap, and Delta airlines providing me a cute little toothbrush and a flimsy comb, I had JUST ENOUGH stuff to sleep, clean up and be presentable for work the following morning. Did I mention my coats were in my suitcase? Uniform yes, coats no. Fortunately, it wasn’t that cold, about 35F. While I was at work, my suitcase was delivered, hooray! Coming next…Part II: The Ford Mustang…Worst. Winter. Vehicle. Ever.